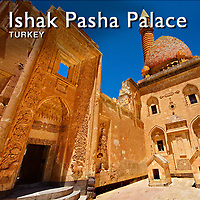 Pictures & Images of the Ishak Pasha Palace (Turkish: ?shak Pa?a Saray?) the semi-ruined palace and administrative complex located in the Do?ubeyaz?t eastern Turkey. The Ishak Pasha palace is an Ottoman-period palace whose construction was started in 1685 by Colak Abdi Pasha, the bey of Beyazit province. According to the inscription on its door, the Harem Section of the palace was completed by his grandson Ishak (Isaac) Pasha in 1784. The Palace is more of a complex than a palace; it is the second administrative campus after the Topkap? Palace in Istanbul and the most famous of the palaces built in recent decades. It was the last large monumental structure in the Ottoman Empire from the "Lale Devri" period. It is one of the most distinguished and magnificent examples of the 18th century Ottoman architecture and is very valuable in terms of art history. The ?shak Pasha Palace is a rare example of the historical Turkish palaces.